Cairo(ANN)-Former Egyptian Vice President Mohamed ElBaradei has warned that authorities in Egypt are “committing mass suicide” by their continued crackdown on dissent as the country prepares for next month’s presidential elections. The opposition figure took to Twitter to voice his opinions after a government critic was arrested last week. “Oppression never was or never will be a solution… nations are built on freedom not oppression, on knowledge not ignorance, on transparency not deceitfulness,” ElBaradei posted. “Could a poisonous atmosphere fraught with polarisation and demonising the other… be the beginning of everyone communicating with each other to renounce violence and set up a nation founded on justice, freedom and tolerance?” ElBaradei questioned. 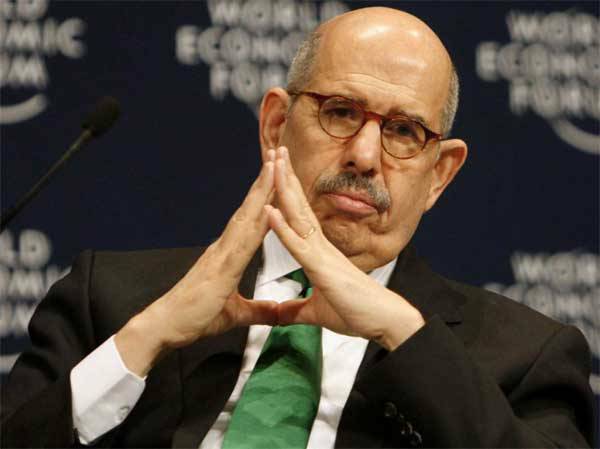 ElBaradei served as Egypt’s vice president in July 2013 until he resigned a month later following a military crackdown on protesters demonstrating against a military coup which removed the country’s first democratically elected President, Mohamed Morsi, killing thousands. His tweets were posted after Egypt’s prosecutor remanded opposition figure Abdel Moneim Aboul Fotouh in custody last week for 15 days over accusations of links he had with members of the outlawed Muslim Brotherhood. Aboul Fotouh was in support of the boycott movement of the presidential elections where current president Abdel Fattah Al-Sisi is widely expected to win a majority with only one unknown figure running against him. Many hopefuls have dropped out of the race citing coercion or have been arrested for opposing Al-Sisi including a former prime minister and rights lawyer. Former military chief of staff Sami Annan was arrested last month after he declared his intention to run in next month’s elections.